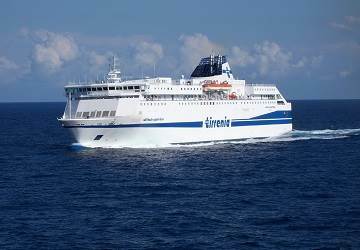 Introduced to the Tirrenia fleet in October 2000, the Rubattino can carry up to 1470 passengers. Amenities you will find on board include a restaurant, 2 bars, cinema, quiet reading area, games room and a shop. Please Note: Whilst we have taken great care in making our Rubattino guide as accurate as possible, onboard facilities, services and entertainment may vary depending on the date and time of year that you travel, facilities mentioned may change without notification and ferry companies reserve the right to operate vessels other than those mentioned at time of booking without prior notification. What to say... everything went well... punctuality clean friendly and helpfull crew. Very recommended...!! The sail went smooth on the Rubattino. It is a beautiful ship, the play area was very enjoyable for my kids. The crew were very helpful, friendly and efficient. Our cabin was clean and the beds comfortable. The announcements were a bit scratchy and difficult to hear particularly in the cabin, but over all an good experience. I highly recommend this service. Prompt departure and arrival, surprisingly spacious and comfortable cabin (outside, ie with window), and an excellent meal in the restaurant. I can't speak for the cafeteria, didn't eat there. On a summer night under a bright moon, it was really very beautiful, and smooth as silk. This ferry is amazing -its size, speed and comfort. The seats are very comfortable -we were sleep all the travel. Unfortunatelly the windows are very dirty, you couldn't take a picture through it. 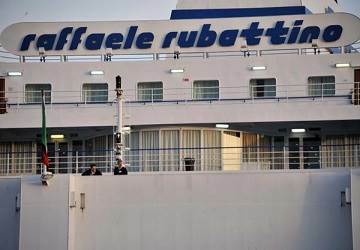 "Palermo Napoli on Rubattino ship"
Journey was good and satified all our needs. Comfortable cabin, we could rest during the night, depsite the rough sea. I do not judge the restaurant because I did not dine in. All excellent on the ship....the allarm ring too early compare to the arrival time. "A good way to go"
We sailed from Palermo to Naples on the Tirrenia Florio Raba. The access to the ferry was quick and simple. Our rooms were ample and clean, for a short "cruise". We were too ate for the serve your self dinner, so we ate in the gourmet restaurant. Limited menu, but good food and wine. Wonderful bar and lounge, however, I missed the casino and disco which were present in the review I had read prior to booking. Egress was quick and simple, would do it again. satisfied about Tirrenia ship. Modern, beautiful style, big and clean cabin. I felt like in a cruise. A great crossing to do the most with your time. The cabin is quiet and clean. We didn’t try the restaurant, so we cannot rate this element. "Palermo to Napoli, nice overnight trip"
We took a standard internal Cabin. Nice and clean. Dinner was ok for a ferry. Two options of restaurants, buffet an a la carte. Would recommend Tirrenia. even if I have appreciated the final price, I made so much effort to have it, the cost of the cabin could not be 130 euro, especially if it is narrow and uncomfortable, we have travelled with our camper on board but we couldn't use the bed inside it for the uncomfortable disposition in the garage area. the ferry is excellent and clean, the staff kind, the overnight crossing is really comfortable, in the morning after you arrive in Naples and we saved one night cost of the hotel. the journey was really comfortable even with the children, the staff were nice, punctual and prepared for everything. We didn't had any inconveniences and enjoyed the cinema on board.